Women’s basketball has started to gain an increasing number of fans in the last few years. In this context, it is safe to say that one major contributor for making women’s basketball favorite is the WNBA Championship held each year in the United States. Many sports fans are interested to find out how much money women basketball players make. To answer this question, we are going to look at the average salary of a WNBA player that is established based on an agreement between the teams and players. In 2013, the minimum yearly salary for a rookie player was over $35,000 and the maximum amount was over $100,000. Besides wages, players gain access to other forms of income from endorsement deals. 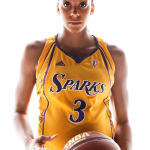 In 2014, Candice Parker was the highest paid WNBA player with an estimated net worth of over $3,000,000 due to endorsements with Gatorade and Adidas. However, there is an enormous gender wage gap. For example, an average WNBA salary is approximate $75,000 while the average NBA salary is around $5 million. This huge difference in wages can be explained by league revenues. Between 2013-2014, NBA generated around $4.7 billion while the WNBA had league revenues of at least $35 million. Maybe in the future, as the WNBA gains popularity, this wage gap will gradually decrease. 6 feet tall (1.80m – 1.82m). The record for the tallest professional female basketball player is held by the Polish Margo Dydek, who played centre position for the Connecticut Sun. Another interesting statistic shows that on average, WNBA players are 7 inches (17.78 cm) shorter than NBA players. This is also one of the reasons why there are fewer dunks made by women basketball players compared to men. In basketball, both men and women wear the same type of uniform which consists of jerseys, shorts, and basketball shoes. Several accessories are also allowed like headbands, wristbands or bands made to protect the biceps or forearms. Another topic of interest for sports fans refers to the following question: “Is there a perfect size when it comes to women’s basketball?” To answer, we are going to look at two of WNBA’s Top 15 Players of All Time: Diana Taurasi and Sue Bird. Diana Taurasi grew up in California and played at the University of Connecticut (UConn) and later in her career for the Phoenix Mercury in the WNBA and the European team Spartak Moskow. Diana has a listed height of 6 ft. 0 in. (1.83 cm) and a weight of 154 lb (70 kg). 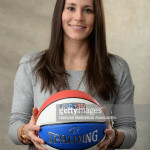 Sue Bird is another popular pick when it comes to famous women basketball players. Sue was born in Nassau County, New York and showed an interest in basketball from an early age. During her successful career, Sue has won the WNBA championship title twice (2004, 2010) and has been voted 9 times for the WNBA All-star. Her listed height is of 5 ft. 9 in. (1.75 m) and weight of 150 lb (68 kg). As you can see both women share similar traits like strength, stamina and skills developed after many years of training. In regards to the height, the taller you are, the easier you play the game. However, this is not an absolute requirement. 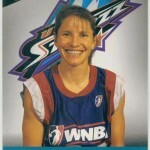 In fact, the record for the shortest WNBA player belongs to Debbie Black with a height of 5 ft 2.5 in (1.59 m). Despite her size, Debbie managed an impressive record throughout her career. She was ranked WNBA – 8th in career steals and WNBA – 10th in career assists which proves that success is mostly a matter of determination mixed with mental strength rather than height.